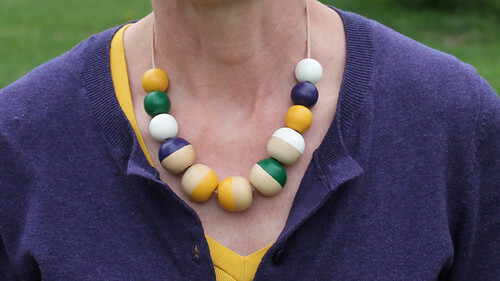 For Mother's Day I made my mom a necklace! I love it, and more importantly, so does she! And didn't she find the perfectly matching outfit?! I got the wooden beads at the craft store and painted them with acrylic paint. I found it easier to paint each bead by putting it on the handle end of a paintbrush (since the are usually tapered it won't slide all the way down the paint brush), and held the paint brush to paint the bead. Does that make sense? I should have taken pictures of that step! After several coats of paint I finished it with two coats of artist's varnish to give it a nice satin finish! At the craft store I also got some leather cord, clasps, and coil ends. I cut my cord to about 18 inches, glued on the coil ends, attached my clasp and I had a necklace! 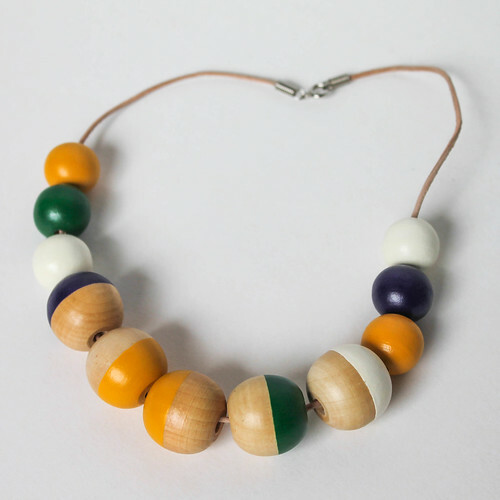 I've been wanting to try a wooden beaded necklace for awhile, especially after seeing Carly's (from Crafted by Carly) and Erica's (from Caught On A Whim)! I have some more beads, perhaps I'll have to make some more! What a wonderful necklace for your Mum on Mother's Day! She is indeed wearing the perfect colours that go with it so beautifully. Well done for your lovely creation. 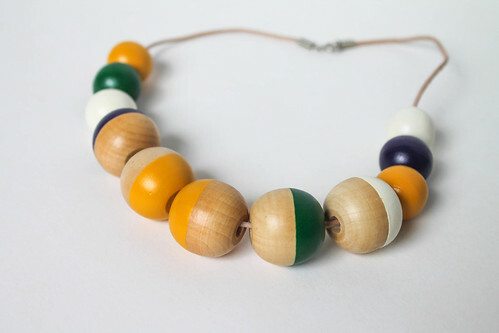 I like the satin finish and the way the beads complement each other in colour and design! I'm not surprised your mum loved it! So cute and creative too.